This is part 2 in my Father's day gift guide, you can see part 1 here. Father's day is two weeks away, June 15th. Thrashion are company that recycle skateboards and make them into something great. 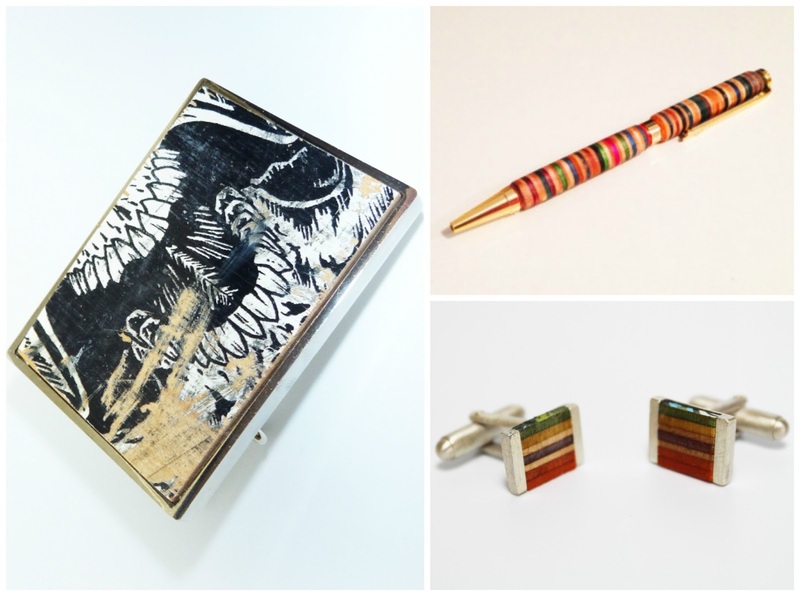 Above are various items that have been made from recycled skateboards - I never knew you could make such cool pieces from a skateboard until now and I think they are pretty cool. Belt Buckle - £22.00. Chrome Twisted Pen - £24.00. Sandblasted Silver Cufflinks - £72.00. I think the pen and cufflinks will especially make great gifts for Father's day. The attention to detail is lovely and you can see just how much times gone into each piece. Shop here. Pierrot et Coco is my new favourite website, everything is absolutely beautiful and you'll find something for everyone, and I mean everyone. 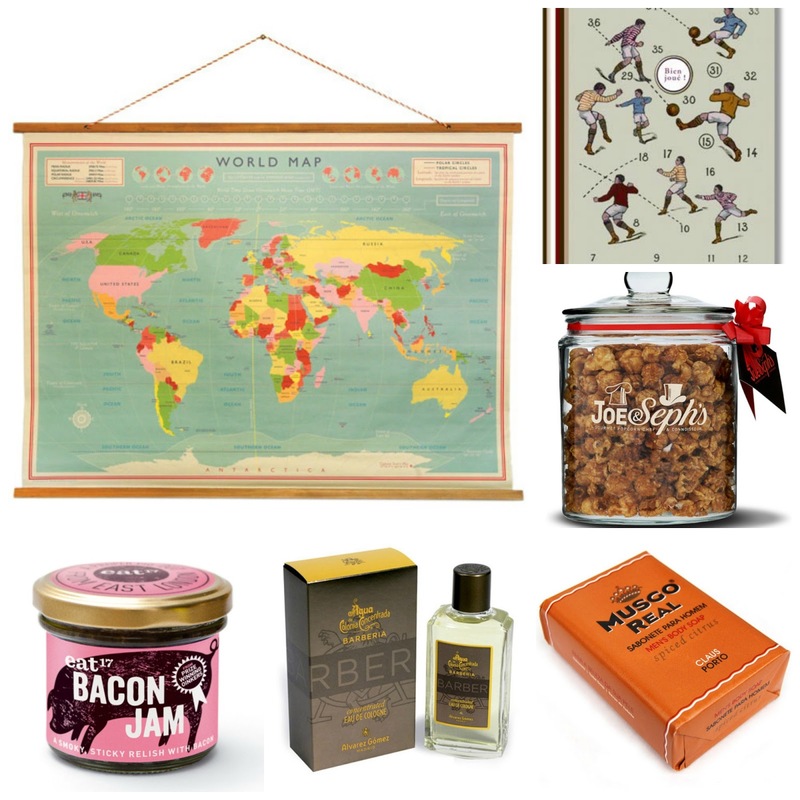 But on to why we're here, with various bits and bobs that could essentially make a great Father's day pressie. Vintage style hanging wall map - £25.00. I think this vintage style map would be great for any lover of geography and would also look amazing in an home office or library too. One for the grandad, maybe? Leather Notebook - £30.00. A stylish note book is always great for jotting things down or taking to the office - if you have a Dad in business. Joe & Seph’s Popcorn Jar: Caramel, Whisky & Macchiato - £25.00. This is such a cute gift - on the pricey side of popcorn but for me personally, as a lover of popcorn I'd pay the price and comes in a lovely glass jar that can be re-used. Musgo Real Spiced Citrus Shaving Cream - £15.00. Czech & Speake Unisex Fragrance - £85.00. Eat 17 Bacon Jam - £5.00. Bacon jam may sound disgusting but the ingredient sounds amazing. Not a jam, but an onion chutney, the mix of bacon, balsamic vinegar, onion, sugar and lemon really hits the spot when smeared on a burger - perfect for any food loving Dad/Grandad (all of you then) and one I'm dying to try. Shop here. Show Plates Direct offers personalised show plates for only £19.95. They aren't legal on the road but are a really fun way to celebrate Father's day (examples shown above). I love the Dads Taxi plate especially. I've always called my Step-dad Dads Taxi because he's forever giving everyone a lift - I've bought him t-shirts and key rings with the logo and this would really add the humour to his number 1 Dad job. You can personalise it with anything you wish to, be that a name and so on. These are cute gift from the children to their dad also. I'd love to get my hands on the Dads Taxi plate. Shop here. 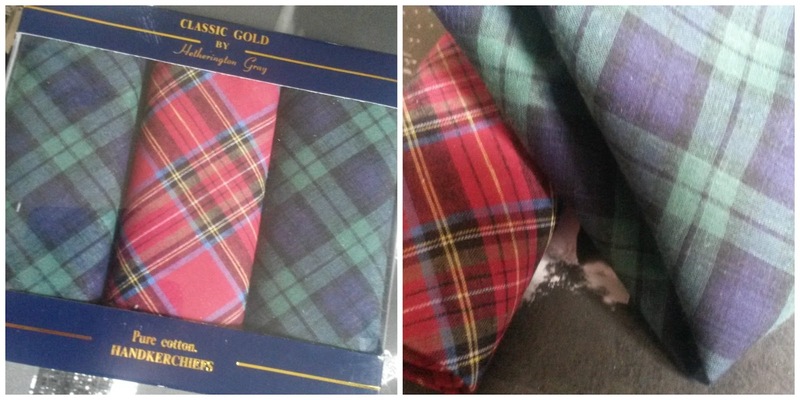 eCornerShop sent me these fashionable tartan handkerchiefs and I believe it to be the perfect Father's day gift your Grandad will love. Growing up I remember my Grandad keeping an Handkerchief in his shirt pocket, he had a huge pile of them. In the box you get three normal sized Handkerchiefs which are all 100% pure cotton and machine washable. They feel like really good quality, though, they don't feel like the softest handkerchiefs ever, but once put through the wash with a little softener I think this will change - they certainly don't feel like they'll fall apart after a couple of washes. These are such a good bargain and don't break the bank at only £3.99. Shop here. Growing up TJ Hughes were one of my favourite stores, unfortunately the one in town shut down and I wasn't happy. It was a great store to pick up a great bargain especially in the beauty/fragrance section, fortunately you can still order online. This Father's Day TJ Hughes are offering a great selection of bargains including Cello 20" slim HD ready LED/DVD combo TV - £99.99. I don't know any man who doesn't sit there, remote in hand after a long day at work. This is perfect bedroom size. 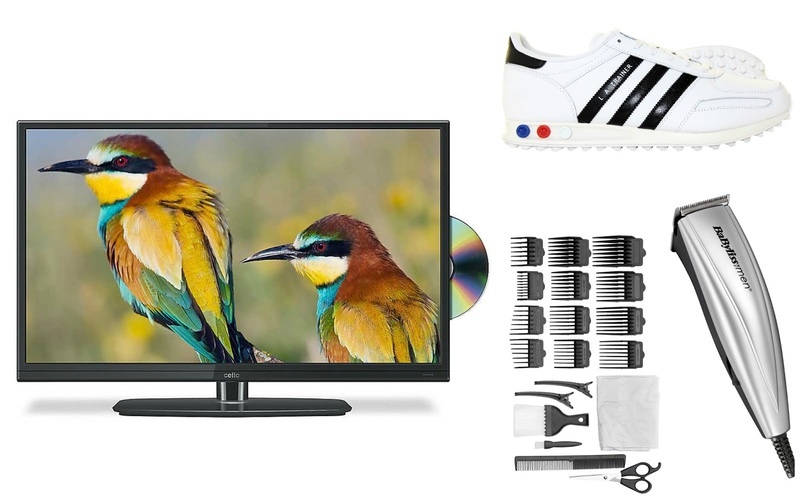 Addidas LA trainers - £39.99 and Babyliss 22-piece professional clipping kit - £14.99 (I need one of these, not for me obviously). Shop here. Think Positive is a jewellery brand that are all about spreading positivity through their jewellery. They have a unique intake on their jewellery with positive life quotes, for example; Think positive, focus, faith and so on. 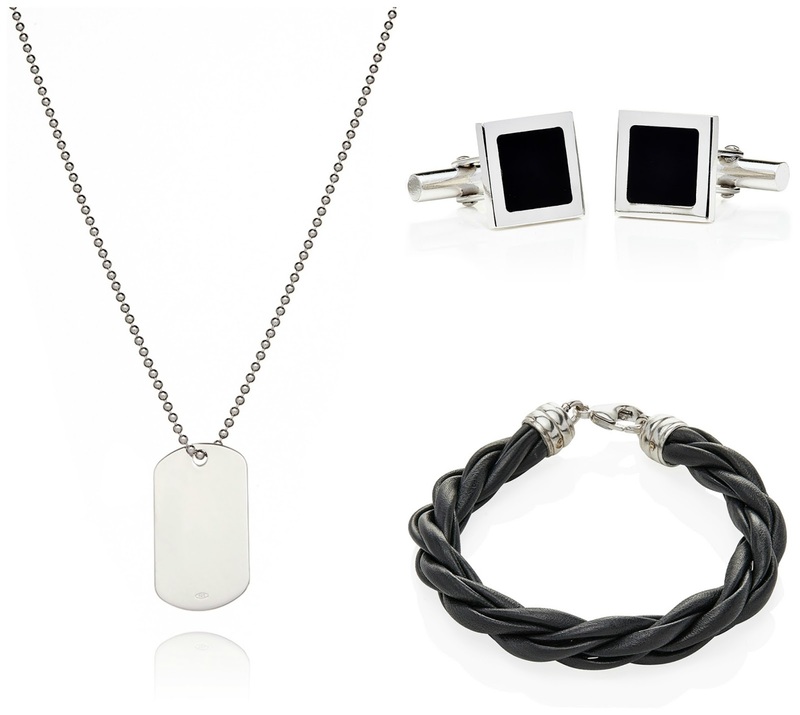 Not only do they have an amazing selection of jewellery for woman, they also have some bits and pieces for men that are both fashionable and on trend. L-R: Necklace with military nameplate pendant - £140 here. I really like this and it's easy enough to get personalised for your loved one or Dad just in time for Father's day. Silver cufflinks with black onyx - £95 here. These are super stylish and look really sophisticated. Black leather bracelet - £90 here. Simple yet so stylish, who doesn't want a masculine bracelet? They should definitely do these in pink. All these pieces are a great way to treat your loved ones and not just on Father's day, Birthdays and Christmas too. Yes, they are a little more expensive but aren't the men in your life worth every penny, ladies? Children's Dad, Father, Grandad, Brother, Son. Shop here. You can see my introduction to Think Positive here. Oakdene Designs are one of the really fab brands on not on the high street, now I don't know about you but I love a personalised gift not only is personal but also special and unique to the person who will receive them. 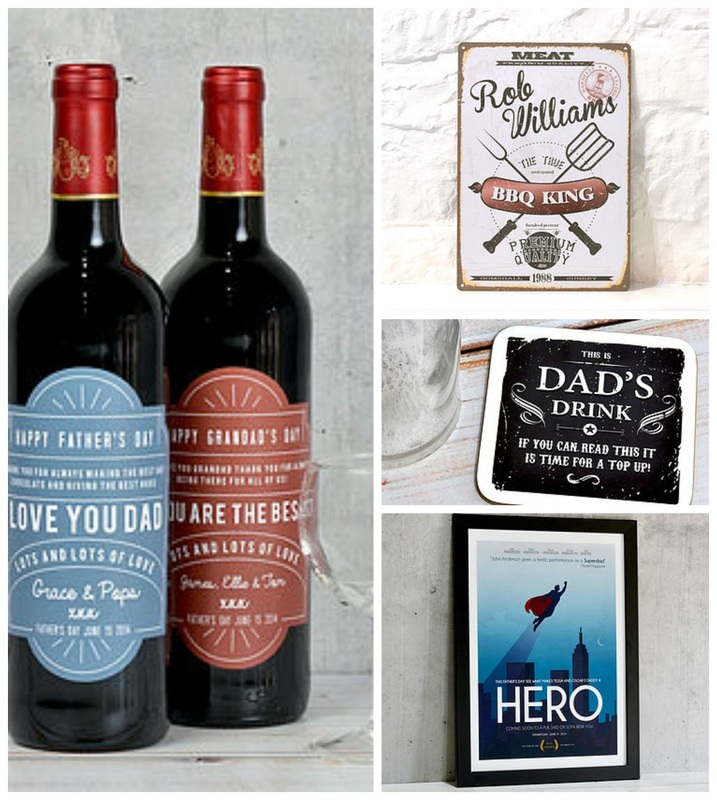 Oakdene do many personalised gifts perfect for Father's day. Personalised Father's day bottle label - £7.50. A Fantastic purchase for any wine lover, the bottle can also be kept and house some pretty flowers inside it? Maybe. Personalised retro BBQ sign - £17.50. I think this retro sign is awesome for any male who loves to cook, or any male that is king of the BBQ in the summer. A great one for those men who need an ego boost so guests just think they cook in the kitchen when really it's their partner (or not). Individual funny Father's day coaster - £7.50. This is definitely one of my favourites and perfect for those on a tight budget. The space can be personalised with any name you wish. Personalised 'superdad' movie poster print - £19.00. Another firm favourite is this movie poster, I really like the whole superdad saying and think it's the perfect gift to send to those partners you have children with. (frame costs extra). Some products in this post are press samples. Some images are my own, however, most images have been sent to me via PR or brands involved in this gift guide. Great gift ideas! I'd totally get that Popcorn Jar. I didn't know that Father's Day is on a different day in the UK. Today is Father's Day in Germany.